“The world,” writes Dr. Jordan B Peterson, “can be validly construed as a forum for action, or as a place of things.” It is this distinction between the physical (a place of things) and metaphysical (a forum for action) that typifies the difference, as far as we are aware, between us and other species. We are hard wired through our biology (as Dr. Peterson notes) to understand: (1) what there is, (2) what to do about what there is, (3) that there is a difference between knowing what there is and knowing what to do about what there is and (4) what the difference is. Perhaps another way to understand this would be to argue that we are meaning driven – it’s not enough for us to what there is, we need to know why. As society has moved through the renaissance into modernity, the questions of why (typically the domain of theology) moved from the arts to science, the preciseness of the latter arguably unsuited to such philosophical questions. The primacy of overtly scientific approaches to understanding life has come at a tremendous cost; in some ways we see the world in shades of grey rather than in full colour. For many thinkers therefore, the pull of the questions of meaning are too strong to ignore. Dr. Jordan B. Peterson is a professor of psychology at the University of Toronto, a clinical psychologist and the author of the multi-million copy bestseller 12 Rules for Life: An Antidote to Chaos. He is one of the world’s foremost public intellectuals, and I caught up with him to learn more about how we can find meaning in a complex world. Q: What does it mean to have a life well-lived? [Jordan B. Peterson] A life well-lived means that you spend a substantial amount of time addressing the troubles of the world—trouble with yourself, your family, your community… Everyone has a sense that things are less than they could be, and everyone is affected by the suffering they see around them – and it seems to me that lays a moral burden on us that can’t be avoided, and that the only way to rectify this burden is to confront it, and try to do something about it. People inevitably find that the worthwhile things they’ve done in their life—the things that give them strength and forbearance and a certain amount of self-respect—are acts of responsibility that they have been undertaking in the face of serious problems. Q: What are your views on society putting happiness as its only goal? 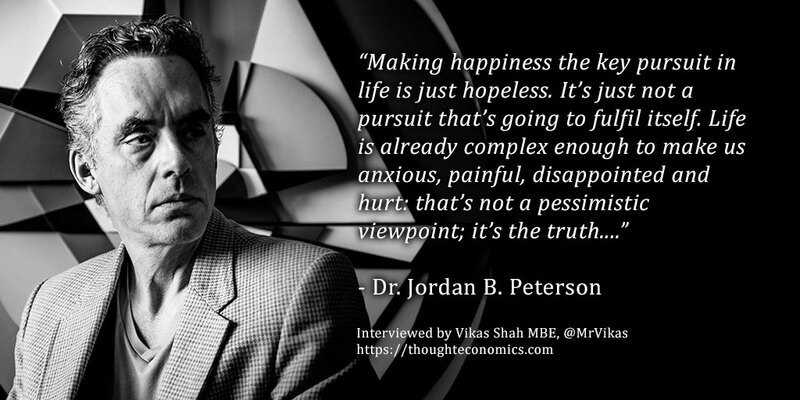 [Jordan B. Peterson] Making happiness the key pursuit in life is just hopeless. It’s just not a pursuit that’s going to fulfil itself. Life is already complex enough to make us anxious, painful, disappointed and hurt: that’s not a pessimistic viewpoint; it’s the truth. My experience has been that it takes very little time to talk to someone, so that if you really listen to them, and get below the surface, you’ll find out how many truly difficult things they’re dealing with on a day-to-day-basis. You do see people in rare periods of life where they’re comparatively carefree- but that’s not common, as far as I’m concerned. The idea that impulsive gratification and ‘happiness’ are going to rectify life’s problems just strikes me as naïve beyond tenability, and so it’s no surprise that life is just a constant disappointment for people. There are studies about the use of Facebook that show that the more people use Facebook, the more depressed they seem to get – and at least one of the hypotheses behind this is that everyone curates the best of their lives on Facebook, and you can understand why. It looks like one big happy advertisement for an indefinite number of perfect lives- but that’s an illusion, a polite illusion. You don’t want to see a picture on Facebook of one of your friends and their partner having a violent or even verbally violent argument. It’s just not what we share on there. We choose to keep that stuff private; but it does have the negative consequence of making Facebook reality seem much more positive than it really is. Q: What is the consequence of making money and celebrity our idols? [Jordan B. Peterson] if you don’t place any emphasis on the development of character, or any belief that character is a reality; If you don’t believe in the utility of courage and truth as the means of making your way through life; then you’re left with – well – celebrity. People are status conscious, and believe that wealth can provide not just security, but the sorts of experiences, I suppose, that would be commensurate with ‘happiness.’ Economic privation is of no pleasure to anyone, but the evidence suggests, unfortunately, that once you roughly earn a lower middle-class standard of living, additional money you earn beyond that has almost no effect on your quality of life. Money allows you to do things, to embark on projects, but there isn’t any evidence that excess money past a certain level has any positive effects on ‘happiness’ or general wellbeing. Once you have a middle-class existence, you have almost all the primary luxuries. Money can’t solve many of the problems that truly plague people. It can’t solve the problems in a relationship between a husband and wife, beyond the narrow economic front. It can’t straighten out the relationships you have with your children—in fact, it can make them worse. Q: How can we feel that we matter as individuals, that I matter? [Jordan B. Peterson] The first thing we can notice is how much trouble we could cause if we act like we don’t matter and cease to take care of ourselves, and the people around us. That causes the irresponsible lifestyle that is predicated on the delusion that nothing matters. That leads to a tremendous amount of misery. You need to attend to the sound of your own conscience and you’ll discover—quite rapidly—that there are problems in the world that are personally relevant to you and which bother you. You can find your destiny, in some sense, in those problems. They bother you for a reason. You can develop a vision that will enable you to confront the dragons of life, to find the gold that’s there, but you have to notice where the problems are, what’s bothering you, and then take responsibility—knowing that if you have a problem, and if a problem bothers you, that’s actually destiny calling you. Sometimes that can come not only in the form of a problem, but an ambition; but generally, ambitions are associated with the desire to solve a given problem – when they’re not shallow and linked to status climbing. Everyone can look around in the world and see there’s something that needs to be done either on a minor scale in their own live, or on a larger scale if they’re sophisticated enough to manage that. Look; if I treat myself like I don’t matter, then I have a terrible relationship with myself. If I have friends, and treat them like they don’t matter, those friendships won’t work. If I have a loved one and treat her like she doesn’t matter, that relationship degenerates. If I treat my community like it doesn’t matter, then it falls apart…. From a practical perspective, we can look at some isolated facts: Life is short, and we’re each one speck of dust among 7 billion individuals, on some isolated little rock, on the edge of the galaxy. How could anything possibly matter? It might be, therefore, that you’re feeling justifiably nihilistic and hopeless, from one rather limited perspective, but it might also mean that it’s quite comforting for you to believe nothing you do matters, because it means you can get away with anything and there’s no price for it. Q: How can we find the strength to have difficult conversations? [Jordan B. Peterson] We need to have a more rarified and realistic view of life. Who the hell wants to have a difficult conversation? Unless you’re narcissistically motivated to win the argument (which is a dominance problem). So many issues in life are unbelievably complicated—and it’s very difficult, cognitively and emotionally, to think these things through. The only thing worse than thinking things through is not thinking them through. When we don’t confront situations, we muddle through, fight and make poor short-term, impulsive decisions. I learned years ago, partly as a clinical psychologist, and partly through life itself that there’s no escaping difficult conversations. All that happens is that the unspoken situation gets worse, the longer you leave it. Sometimes, conversations are unbelievably stressful—people get upset and sometimes they won’t talk to each other for weeks (plus it’s hard to come up with a real solution for many things in life)—but the alternative to peaceful negotiation, no matter how stressful, is tyranny or slavery. Q: How can we confront those we don’t agree with? [Jordan B. Peterson] If you violently disagree with a person, what you think they’re saying, or standing for, you have an opportunity. The more different the other person is from you, and the more you listen to them, the more likely you are to learn something shocking and necessary. These conversations provide an unparalleled opportunity for growth. First of all, you find that, generally, the other person is a lot more like you than you’d like to think – and you’ll also find that they’ve thought through their arguments (even though you might regard them as prejudicial or unfair). They have their reasons for thinking the way they do, and that makes the world more complex, because it doesn’t fit your simple ideology. You’d have to be a fool not to think that people have valid complaints about the way nature and society treat them, or the way they’re treating themselves. It’s not unreasonable to figure out that people have genuine burdens, but that’s not the issue. The issue is what you do about it—and becoming bitter, resentful, cruel, resented and prejudiced is not helpful. It makes the situation (often already intolerable) worse. Personal responsibility matters. The radical left will tell you all of life is arbitrary, and it’s true, in a sense. People have all sorts of unique privileges, obstacles and disabilities. The world’s resources are so unequally distributed that it’s a constant existential nightmare, and it’s easy to turn that into a criticism of existence itself… but an attitude and actions grounded on that observation will just accelerate the original inequality into something that looks like hell. You need to act courageously, confront your obstacles, and speak truthfully. There’s no guarantee that it will work, but it’s the best bet. Q: How did you choose the path that has led you to public life? [Jordan B. Peterson] Back in the 1980’s, I decided to tackle the problem that I thought was most difficult to me; the great gap between the Soviet Communist movement and the Western Capitalist movement. I always thought if you could understand a problem you might be able to come to some resolution of it. Intermingled in that was the problem of Nazi Germany, which I was a totalitarian response to looking at the world. I was curious: There were these other ways of looking at the world—national socialist and soviet communist—was there any difference between those viewpoints and our viewpoint, or was it all just arbitrary game playing? I concluded that it wasn’t game-playing, and the West especially had specially and uniquely emphasized the divine sovereignty of the individual, and the importance of the individual voice. This held true theologically, metaphysically, philosophically, psychologically and biologically. It was apparently reflective of something extraordinarily deep about the structure of the world as a whole. The idea that the individual is the locus of a kind of divinity is true; there’s no better explanation for the way the world lays itself out, for good or for evil. Once I figured that out (or concluded that, let’s say) I spent a lot of time arguing with myself. It took me fifteen years of thinking to get this idea straight in my mind. It was not an easy conclusion to come to. This extended reflection had a profound effect on me, and I wanted to teach other people what I had come to understand (partly to observe the consequences). So that’s what I did at Harvard and at the University of Toronto for twenty-three years. The course based on my first book, which was called Maps of Meaning was very popular, and considered influential. Then I started to broadcast on TVO, a small Ontario-based Canadian public television station (to reasonable acclaim, given the scale of the operation). Then I started to play with YouTube, because I thought, ‘well, there’s obviously somewhat of a public market for this. What happens if I make the content acceptable to everyone?’ The technology was there, and I was curious about it, in itself, as I’m curious about everything (which is a very dangerous way to be). I put these videos up on YouTube, beginning in 2013, and they started to accrue a lot of views—long before I got involved in the endless political controversies of my recent life. By early 2016, I had a million views on YouTube (which isn’t overwhelming by YouTube’s standards) but it’s still 20 stadiums full of 50,000 people. It’s a lot of people. Since then, I’ve just been experimenting and expanding that channel. My podcast was derived from the YouTube videos and has more listeners than the YouTube channel has views. I’ve also been writing for the Postmedia Network consortium, which owns about a hundred newspapers and magazines in Canada, and of course I wrote 12 Rules For Life, which had a huge impact. I also completed a series of lectures on the bible in 2017, renting out a theatre (just just out of curiosity, to see if people would come and listen), and they all sold out and have been watched by 10 million people on YouTube, and listened to by more as podcasts—so I definitely plan to continue the Biblical lectures. I’m trying to communicate on a large scale; it’s very rewarding, but also hugely daunting. My channel has 100 million views, and if you count-up all the chopped-up videos that others’ produce it’s probably nearer 400 million. Let’s say that’s 100 million people (or even 50 million) a substantial proportion (who are every sort of person you can imagine) could be violently opposed to what I’m doing and cause a lot of strife and misery along the way; and that’s very stressful… and that includes a tremendous number of journalists. I’ve certainly had more trouble with journalists than with any members of the general public I’ve ever encountered. It is said that you shouldn’t build your house on sand, but on a rock. If you build your house on sand then the wind blows it away—and there will be wind—and so I was looking for a rock that a house could be built upon, and as far as I can tell, at least for me, I found something I couldn’t undermine (and I’m pretty good at undermining things). I thought, ‘well, here, I can tell other people what I concluded, and see what they think, and maybe it’s wrong, in which case I should discover that and fix it—or maybe it’s correct, whatever that means, and then people really need it. The evidence seems to suggest (and I can say that without exaggeration) that people need it far more than I would have possibly imagined.